Celebrate Valentine's Day with an early $140 free chip gift at Grande Vegas Casino! Players who have completed a deposit in February can redeem the coupon code 14-EXTRA to claim the $140 Free Chip and win up to $250, but do not claim two freebies in a row. This special bonus code is only available until February 17th, 2019. Good luck! This bonus can only be requested after one successful deposit in February has been completed. $10 max bet; Expires 31 February 2019. General Grande Vegas Terms & Conditions apply. $180 max cashout 60x wagering on slots. 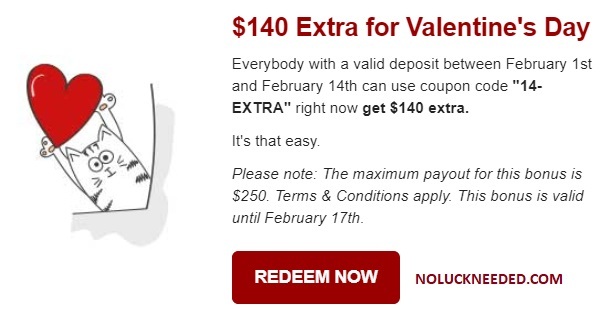 Claim a Valentine's Day $140 Free Chip at Grande Vegas Casino! You can claim the $140 free chip now if you have completed a February deposit.